Just eight days into August and we’ve already used an entire year’s worth of resources – the amount that the Earth can replenish annually. 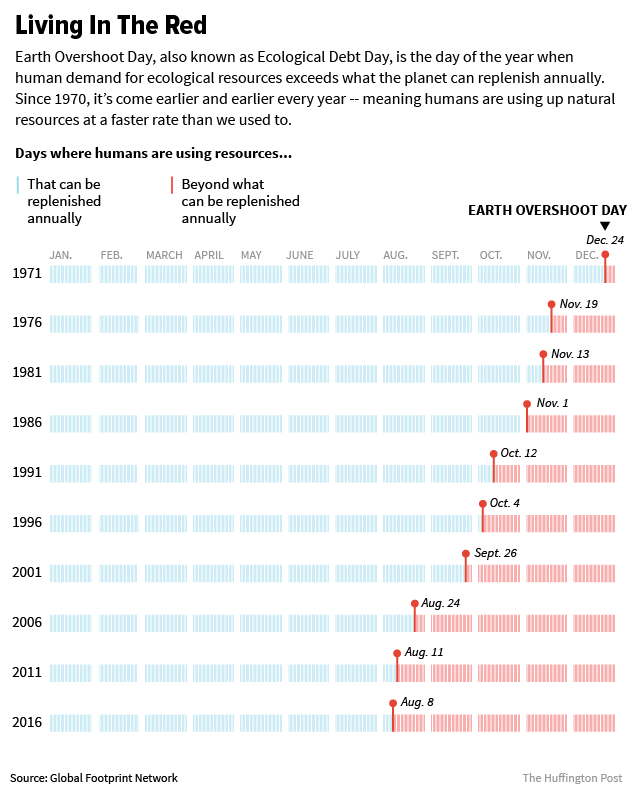 As this Huffington Post graphic shows, so-called ‘Earth Overshoot Day’ has been getting earlier and earlier every year, highlighting our rapidly increasing use of resources. It’s fallen five days earlier this year than it did in 2015. In 1971, it fell on 24 December. Our increasing use of the world’s resources is putting life on Earth at risk. In fact, to sustain our current levels of consumption, this year we would have needed the equivalent of 1.6 Earths. 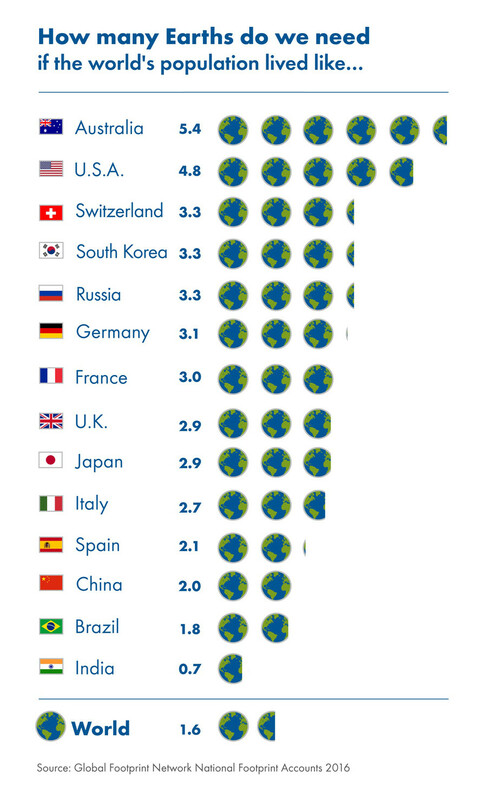 But, some countries are worse than others, as this graphic from the Global Footprint Network (the think-tank behind Earth Overshoot Day) shows. The list is dominated by developed nations, with Australia topping the list. If we all lived like Australians, we’d need the equivalent 5.4 Earths every year. A similar picture emerges when you look at the situation on a country-by-country basis. 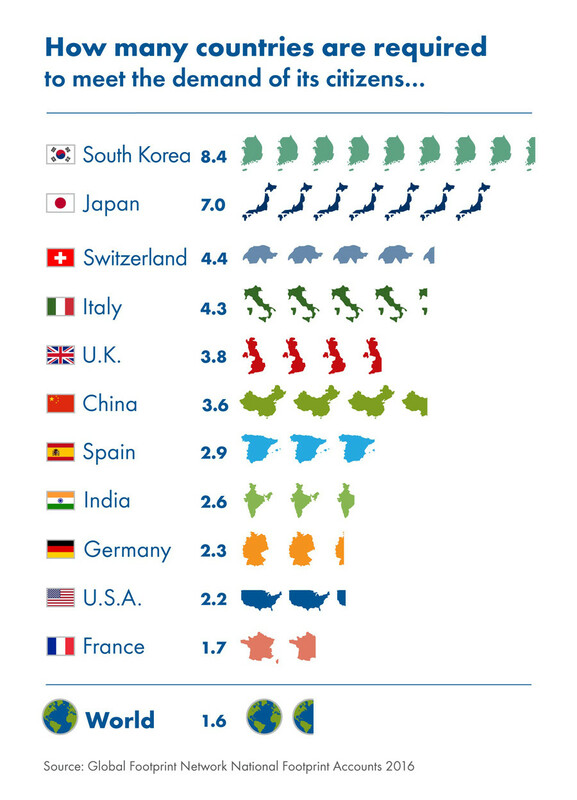 South Korea has the biggest ecological debt of all countries on the list. It needs the equivalent of over eight of itself to meet the demands of its citizens. Have you read? Resource efficiency: lessons from Henry Ford on doing more with less What are the Sustainable Development Goals?